The Flash is dealing with some particularly good stuff this week, mostly revolving around the power of truth. How important truth is, how important it is to control one’s own truth and when it comes out, and how the reveal of one truth and the reveal of a seemingly similar truth don’t always end in the same way. The good episodes of this show always have tightly interwoven parallels, and “Time Bomb” — while still exhibiting some flaws — has tightly interwoven parallels up the wazoo. Once again starting the episode in 2049, Nora confronts Eobard Thawne about the new Cicada that popped up last episode after the original Cicada was cured of his Cicada-ness. Nora is understandably upset, since Thawne promised he knew what was going on and how to stop Cicada, but now Thawne says he was “very wrong.” Well gee, thanks for that sudden self-awareness, megalomaniacal murderer from the future, but it’s not particularly helpful. Nora begs Thawne to help, but Thawne’s only advice is for her to tell Barry all about her partnership with him and her mission in the past. Meanwhile, Grace has revealed who she actually is to her uncle Orlin, who doesn’t seem particularly happy about his adopted daughter taking his metahuman hatred and running with it, straight into a life of vengeance and violence. She tells her story, then says she has stuff (read: murderin’) to do, but when she gets back she and Orlin are going to work together to get his Cicada powers back. 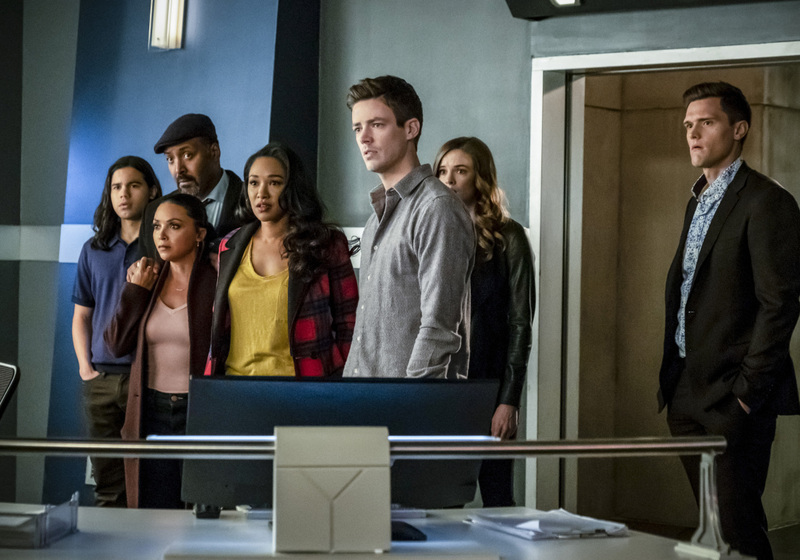 During their investigation into why anyone would kidnap Orlin Dwyer after his surgery, the civilian law and order side of Team Flash has hit a brick wall. Dr. Ambres didn’t talk to people at the hospital where she worked and had a reputation for being withdrawn and angry, only really brightening up when dealing with comatose Grace. Considering this and what happens later in the episode, I just don’t get what the handle on Grace’s personality or motivations are meant to be. The writers seem to want to imply that Grace’s brain injury, plus influence from overhearing the people around her — namely, her uncle Orlin and Dr. Ambres — resulted in her deep hatred of metahumans. Like a kind of brainwashing made stronger by the dark matter shrapnel in her skull. But the fact that Grace kills the people she should be essentially super-brainwashed into wanting to protect just gives me the feeling that the writers don’t have any idea what her emotional motivation should be. They just want her to be a wildcard anti-metahuman force, with no logical movements or a structure to her villainy, and I’m not sure I buy that. Maybe I’ll be proven wrong later and Grace will become an interesting, multifaceted villain. I doubt it, but maybe. Back to the plot: while Nora still hesitates to tell her father the whole truth, Sherloque is still trying to uncover Nora’s secrets himself by interpreting her diary entries. (Side note: the diary entries we see on screen are some fantastic examples of effects people having fun and include mentions of a 2023 Chicken Plague that puts Chipotle out of business, Subway turning from sandwiches to yoga, and apparently a whole journal entry detailing her crush on Spencer Young from the episode “News Flash.) Since Nora includes no names from the future in her diary, Sherloque finds nothing. S.T.A.R. Labs gets an alert that something’s been stolen from their archives (“Starchives”) and placed in the woods somewhere. 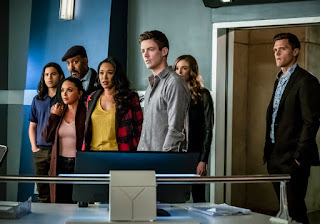 The team splits up, Ralph and Iris going to the actual Starchives to check while Cisco breaches Sherloque and himself to the location in the woods. Both teams find the same thing: Eobard Thawne’s Time Sphere. When Barry and Iris convene on the Time Sphere in the woods, Cisco and Iris perform “Operation Shazam”: to prove that the Time Sphere in both places is the same, Iris scratches the surface of the one in the Starchives and the same scratch appears on the one in the woods. It’s actually really cool. Fun with time travel! Anyway, Team Flash figures out the Cicada who kidnapped Dwyer must be from the future since there’s no such thing as coincidence when Time Spheres are involved. And why is Cicada II traveling through time? A little investigation leads Barry, Cisco, and Nora to an ATM that was part of a metahuman crime scene back in 2017. Although the ATM and the surrounding wall were destroyed in the initial explosion, Cisco vibes a scorched hunk of concrete and confirms in-universe what the audience has known for ages: Cicada II is Grace Gibbons from the future and she’s targeting the meta who killed her parents. Unlike most non-Team Flash metas on this show, though, said metahuman (Vickie Bolen) isn’t a thief or a criminal or even bad at all — she’s just a meta whose powers triggered on at the wrong moment. Vickie didn’t even know she was the cause of the ATM explosion, since her powers affected the machine and only exploded after she’d gone. Even when Joe clarifies the situation for her, Vickie refuses to go into police custody or tell her family about her powers — a decision that Barry, having experienced something similar in the past, vehemently disagrees with. This little plot point about keeping secrets connects with the secret Nora’s keeping, of course, but Nora’s connection to Cicada II goes beyond just emotion implications. She apparently has a psychic connection to Grace, probably thanks to her trip into Grace’s brain earlier in the season, and can predict when Cicada II attacks at a birthday party for Vickie’s daughter. Vickie attempts to stop Cicada II by using her powers, but the little girl gets caught in the crossfire and has to be taken to the hospital, where Cicada II attacks yet again. Even Orlin (whose rage might have been enhanced by the dark matter in his system, come to think of it — he seems weirdly rational now) can’t get through to Grace and stop her rampage. She ends up killing her uncle, so there’s that other half of the “what’s her point?” question I raised earlier in this review. After Cicada II is (temporarily) stopped and the Bolen family is put into protective custody, Team Flash still has some stuff to deal with. Nora is partially inspired by the reconciliation between Vickie and her family after the latter had a poor reaction to her powers. She’s still struggling with how, but Sherloque takes it out of her hands and tells the rest of the team she’s been working with Eobard Thawne this whole time. The reaction is... significantly more poor than the truth coming out in the Bolen family. Barry straight-up locks Nora in one of the metahuman holding cells, where she breaks down crying — alone. While I kind of like that the whole “distract Sherloque with a new girlfriend” plot from a while back completely backfired just because it’s amusing how little it changed, it really highlights the pointlessness of that episode. Shout out to the physical comedy going on with Ralph dodging a broom-wielding Sherloque. My favorite scenes are the ones that get the closed captioning “[irreverent pizzicato music]”. “You don’t think she’d make a good Spider-Person?” The improvement of the Ralph Dibny character is by far the most impressive thing this show has ever accomplished. Next week: Nothin’. See you on April 16th.